The North City neighborhood in Shoreline, Washington is one of the fastest-growing residential communities in the Seattle metro area. Located around 20 minutes away from downtown Seattle by car, this district in northern Shoreline is a hotspot for professionals that commute to the big city every day. Shoreline features a very low crime rate and the real estate vacancy level is far below the national average only 1.3 percent. The total population is 55,439 people. Property Management in North City, WashingtonThe neighborhood of North City was named by Shoreline business owners in the late 1940s. To learn more about the history of Shoreline, you can visit the Shoreline Historical Museum on Linden Avenue. On your way, you can take in some of the beautiful local sights such as Ballinger Lake Park, Kruckeberg Botanic Garden, and Richmond Beach Saltwater Park. Property managers in this Shoreline neighborhood will want to know that this community boasts one of highest percentages of people with Welsh ancestry or Ukranian ancestry anywhere in the United States. Also, more people speak Japanese at home than in 98.1 percent of American neighborhoods. The average income in this Shoreline neighborhood is higher than 71.7 percent of US neighborhoods, meaning that the population is predominantly upper-middle class. The average home value in this Shoreline district is $461,800, which is higher than 69.4 percent of the neighborhoods in Washington and higher than the cost of a home in 82.7 percent of neighborhoods in the United States. Median home age in Shoreline is 48 years and home appreciation has increased by 22.24 percent in the last 10 years. Almost 25 percent of homes in shoreline were built between 1950 and 1959, making this the most industrious period for home development in the history of this Seattle suburb. 17.3 percent of homes were built between 1960 and 1969, with a sharp decrease in new home building in the decades to follow. About 34 percent of Shoreline residents rent rather than own their homes. The average cost to rent a three bedroom home or apartment in Shoreline is $2,010 per month, which is significantly higher than the United States average of $1,379 per month. Median gross rent in Shoreline was reported as $1,215 by the US Census between the years of 2012 and 2016 and, according to Neighborhood Scout, the current average rental price is now $1,936. This Shoreline neighborhood is designated as an urban neighborhood based on its population density. 42.9 percent of the residents of this Shoreline district are employed as managers, executives, or some other type of professional occupation. Residents employed in the service sector, which covers everything from janitorial work to high-paying sales positions, make up 24 percent of the population. The remaining employed individuals living in this Shoreline neighborhood work either in the manufacturing and labor sector (17 percent) or in the clerical and tech support sector (16 percent). Every neighborhood in America is composed of a unique mishmash of cultural influences. All Americans are descended from immigrant stock, whether the immigration in question occurred thousands of years ago over the Bering Land Bridge or just a few months ago across the southern border. No community in the United States is exactly the same as any other, and this Shoreline neighborhood is certainly no exception to the rule. German and Asian ancestry tie for dominance at 16.4 percent. 11.4 percent of residents report that their ancestors were English and 10 percent say that they are of Irish stock. 5 percent are from Mexico and 22 percent of residents were born in a country other than the United States. The primary language spoken in this Shoreline district is English at 73.4 percent of households. Other languages spoken at home in this area are Tagalog, Chinese, and Spanish. The average age in Shoreline is 41.5 years, which is significantly higher than the United States median age of 37.4 years. 49 percent of Shoreline residents are married while 11 percent are divorced. The average household size is close to the US median at 2.46 percent. 32 percent of residents are married and have children while 12 percent are single parents. There are 21,360 total households in Shoreline and 13,064 are family households. Partially due to higher housing costs and the proximity to the big city, the cost of living in Shoreline is listed as 156.3 as compared to the US average of 100. While this area of Shoreline is more expensive to live in than many neighborhoods that are located a little farther out from Seattle, being closer means that commuting is easier for those that work in Seattle, Tacoma, or Bellevue. 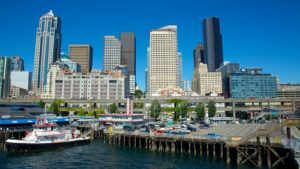 Shoreline hasn’t grown much faster in size or population than the national average, but property managers will always have their hands full in this town since property within a close distance to the Seattle metro area is constantly in demand. Higher rental and homeownership costs bring with them a greater potential for success to Shoreline property managers, but higher maintenance and tax costs are also implied. While new homes are hard to come by in this Shoreline neighborhood, most of the older homes are in good shape and the plenitude of local parks and schools are a huge draw. Contact us for an exhaustive overview of your rental property. Our property management team specializes in residential areas throughout North City, WA. We offer multiple services to take your rental property and convert it into reliable income. We have a thorough screening process that helps to identify the right tenants for your property. Our team works hard to keep both parties happy through effective communication, bullet proof lease agreements, and timely monthly rent collection. We offer maintenance services to enhance the property and ensure that it will retain or increase in value. We oversee everything, allowing you to sit back and relax and know that your property and your tenants are in good hands. Contact us today if you are ready to receive a comprehensive analysis of your rental property and to inquire about our North City area property management services.